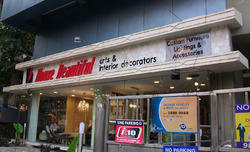 Exterior signage can be of any style made of LED Letters, ACP Panel, illuminated flex box, MS frame with star flex, etc. We offer high quality Exterior Signages. Assisted by a team of experienced designers, we offer to our customers Exterior Signages, which are used for various advertising and promotional campaigns. These signages are made with hooks at the back for easy installation and are placed at different exterior locations for increasing the brand visibility of the client. We are offering Exterior Signs to our client. Our company is highly rated in offering Exterior Signs to the clients. These products are manufactured under the guidance of experienced professionals using the finest quality raw material and innovative technology. Exterior Signs is strictly tested against variegated parameters by quality examiners so as to ensure resilience. We are actively engaged in offering a qualitative range of LED Exterior Signage for catering the diversified requirements of our clients. Running with an objective to acquire maximum level of customer satisfaction and trust, we are involved in manufacturing and supplying a distinctive assortment of Hospital Exterior Signage. - Used to address and advertise hospital. Enhancing the brand visibility, we offer to our customers exclusively designed and manufactured Boards Signage. These advertising boards are designed with the assistance of qualified designers, who understand the latest trends of the advertising industry. We put in our best efforts to match with the expectations of the customers and offer them with best of the advertising solutions. Justifying our status in the industry, we are able to offer a comprehensive spectrum of Custom Exterior Sign Board.